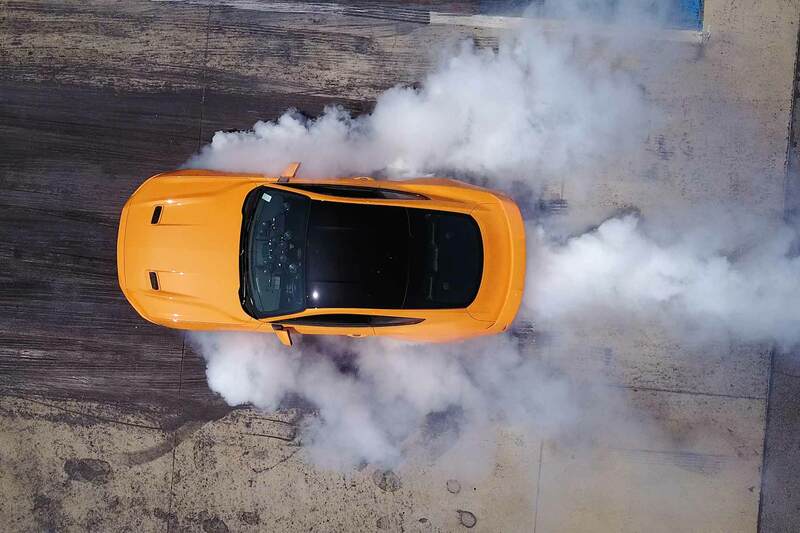 Ford has announced the facelifted 2018 Mustang range will feature the tyre-smoking Line-Lock function on all models, including the eco-optimised 2.3-litre EcoBoost turbo. Previously, Line-Lock was only available on the 5.0-litre V8 GT. What’s more, Ford is also introducing a new 12-inch digital instrument display – complete with an animation of a spinning wheel creating plumes of smoke when Line-Lock is engaged. Proudly, Ford calls this an “industry first”. Also note the big red ‘Track Use Only’ disclaimer: Ford insists this is not a feature for road use. The facelifted 2018 Mustang range, which is headed to U.S. customers first before rolling out in the UK later, will also offer a 10-speed automatic gearbox for the first time, alongside the six-speed manual: again, you can have Line-Lock on either. There’s a smoother new look front and rear, engine power upgrades and, for the GT, both MagneRide adaptive dampers and active valve performance exhaust options available. The 2018 Mustang will continue to offer the driver-assist functions that recently improved its Euro NCAP rating from two stars to three stars. There’s a possibility this facelifted model could lead to further improvements if and when it’s retested by Euro NCAP at some point in the future, too. What is Line-Lock? A tradition of drag racers, that’s what: ahead of the start line, the furiously spin their rear tyres to heat the rubber and gain extra traction. Ford argues it’s useful here for amateur racers competing in drag races, helping them clock more consistent times. Really, though, it’s just one big, wonderful, smoke-laden showcase. It’s operated by the steering wheel buttons: scroll through menus to activate it and the all-electronic system first builds up pressure in the front brakes. Press another button to hold this for 15 seconds and the driver can then hit the accelerator pedal and spin the rear wheels with abandon, while the car itself remains firmly in place. Perhaps check your local tyre fitter has a set of fresh rear rubber in stock before you indulge, though.